The cloud-and-data-services company reported solid third-quarter results, but investors crushed the stock last month. Shares of Talend (NASDAQ:TLND) dipped 43.9% in November, according to data provided by S&P Global Market Intelligence. The stock plummeted after the cloud-and-data-services company reported third-quarter results that were better than expected, paired with disappointing guidance and a new acquisitions move. Talend reported third-quarter results on Nov. 7, with sales climbing 36% year over year to reach roughly $52.1 million. The company's adjusted losses for the period came in at $0.09 per share, beating the average analyst estimate's call for a loss of $0.10, but fourth-quarter targets and comments from management seem to have sent the stock tumbling. 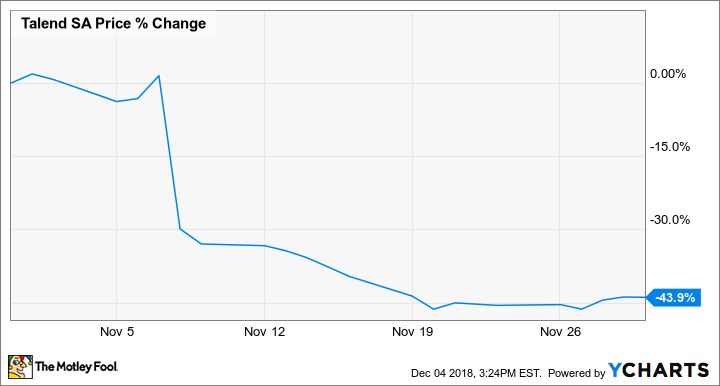 Talend expects its fourth-quarter losses to come in between $0.12 and $0.16 per share, while the average analyst estimate had guided for a $0.09 loss prior to the recent earnings release. Revenue for the current quarter is expected to be between $56.6 million and $57.4 million, which also fell short of the average analyst target. Management stated that demand for its on-premise data management solutions is declining, particularly among new customers, so investors may be looking at that trend as an obstacle to future growth. News that Talend had acquired Stitch, a data-integration software company, at a $60 million price may also have been a factor in the big sell-off. 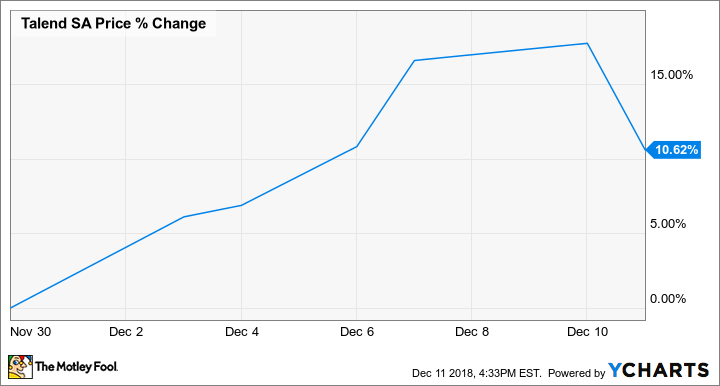 Talend stock has regained some ground in December, trading up roughly 10.7% in the month so far despite sell-offs for the broader technology sector. The positive movement this month appears to be a reaction to the dramatic sell-offs in November, as there doesn't seem to have been any big news to prompt the gains. While declines for Talend's on-premise data management solutions aren't encouraging, the company still posted solid growth last quarter -- with a 71% year-over-year increase for cloud and big-data solutions subscription revenue being particularly impressive. The company has a market cap of roughly $1.15 billion and trades at roughly 5.6 times this year's expected sales.